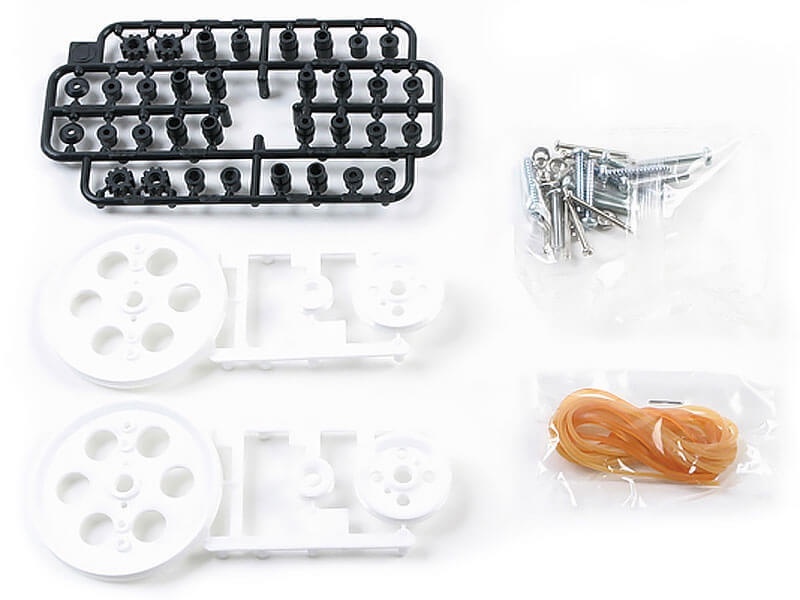 The Tamiya Pulley (L) Set contains pulleys which can be mounted directly to parts such as the Tamiya Universal Plate Set, or they can be mounted using shafts such as those included in the Tamiya 3mm Diameter Shaft Set. The set includes six pulleys of various sizes along with an assortment of single and double bushings that make the pulleys compatible with round and hexagonal shafts of both 3 mm and 2 mm diameters. Depending on the bushing, the pulleys can either idle on a shaft or rotate with it. The double bushings allow for pulleys to be connected and sit next to each other on the same shaft. Other parts in the set include a belt guide for use with a motor shaft, belts, and a screw and nut set.